Why does this blog exist? Simple - because my miniature pinscher is my baby. Because she gets cold in the winter and on rainy days and needs cozy sweaters to keep her warm. And because finding doggie sweater patterns that will fit a min pin correctly is nearly impossible. What I can't find elsewhere, I make for myself. 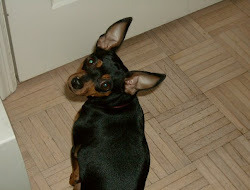 Since I have to create my own patterns anyway, I'm glad to let other min pin mamas (and daddies) :-) reap the benefits. I'll make the patterns and post them on here so you can download them. All I ask is that you keep them for personal use. Please don't 1) sell my patterns, 2) repost them and claim them as your own, 3) use them for commercial purposes. Needless to say, I haven't had much time for little dog sweaters lately. Poor Pebbles never did get her little dog Christmas sweater, and now I'm working on a shirt and scarf for me -- I know, selfish! -- so she hasn't had anything new lately. I think she needs a new summery blankie. Pebbles must be covered when a blanket whenever she sleeps, no matter how hot the weather. I think it must be a security thing. Anyway, she crawls under hot afghans and throws and it drives me crazy that she lays under there sweating and panting. I think I'll make her some little lightweight lacy blanket so she can feel covered up with out really being covered up. I'll have to hunt around for a stitch style I like and get started on it. My model and your unknowing benefactor. Without her shivers, I wouldn't be making these great patterns for you! 2010, Stacie LaBean. Simple theme. Powered by Blogger.